It being a nice blustery day but not actually cold, I set off to walk in the other direction from my perambulation to St. Andrews a month or so ago - this time walking to Crail along the coastal path. In theory this should be a shorter walk, as Kingsbarns is closer to Crail than to St. Andrews, but once you take into account the fact that the coast takes a less direct route than the road does, it may be a comparable distance. It certainly took me about the same time, although I think I was dawdling a bit more this time. I started off with a brief detour to the clubhouse of the Kingsbarns Golf Links to check on pricing details for the boss, who wants to play a round there, then it was down to the shore to hoof it to Crail. The first stretch of the walk is all alongside the golf course. In fact, the golf course runs further along the coast than I had thought, as it extends past Cambo House for several holes. Hole 15 looks a bit tricky, as it's along a very thin strip between the woods and the rocky shore. Further on, a couple of holes are played under the cliffs of the raised beach, although there seems to be a strange aversion to having rich patrons actually playing over the cliffs. After a while however, there is respite from the need to guard against airborne incoming, and the path descends onto the shore itself for half a mile or so. I've been lucky in that going both ways I have chosen times when the tide is low. Parts of the path are inaccessible at high tide - such as the junior cave on this stretch which is plainly in the process of being formed by wave action. I wish I could claim meticulous planning, but it's entirely fortuitous - otherwise I would have had to wait for the water to recede before I could pass. After half a mile of boulder-strewn beach, the path mounts a small headland and there ahead lies - oh. Another golf course. In fact, as it turns out, another two golf courses (the Balcomie Links, originally designed by Old Tom Morris, and the recent Craighead Golf Course). Sometimes it seems that you could walk all around Fife without stepping off a golf course, but I hadn't expected these ones as they are well back off the main road which I'm usually travelling along. However, I should have known better as Crail does after all have the 7th oldest golf club in the world, which pre-dates both the current courses. Eventually the golf course brought me to Fife Ness, the most stickiest-out bit of the Fife peninsula. (Funny how people don't often refer to the kingdom as a peninsula, though it is.) This was obviously a place of note, there were a number of things to see. First of all, I passed the lifeboat station (long disused) then, although not much attention was drawn to it on the spot, Constantine's Cave. One version of history has it that King Constantine I was killed by Vikings there in 874 AD. The Fife coast seems to be a bad place for kings - Constantine II died at St. Andrews (although admittedly he'd retired there), and Alexander III died in a drink-driving accident with his horse at Kinghorn, precipitating the Wars of Independence from which only the combined might of Mel Gibson and Spiderman could deliver us. 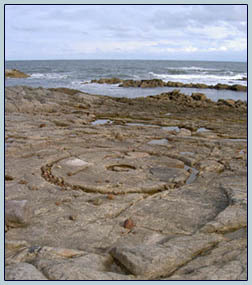 A little further on, there were the remains of a tide-mill, measurement circles and arcs cut in the stone by Robert Stevenson, grandfather of Robert Louis Stevenson, in the process of building a stone lighthouse for the North Carr Rock, and remains of a disused harbour. There's even less of the harbour construction left than at Kingsbarns, but it's still more complete as it took advantage of a natural rock channel. The common lesson to take from the two harbours and Stevenson's North Carr Rock lighthouse would be - don't mess with the North Sea! To reinforce that, the next feature to be passed was the coastguard station, which is responsible for monitoring 340 miles of coastline from Berwick-upon-Tweed to Stonehaven. Also here was the first of several pillboxes, and a hide for birdwatchers. With the coastguard station behind me, I was round the Ness and could no longer glimpse Kingsbarns in the distance when looking back. The path fairly quickly entered the Kilminning Coast Wildlife Reserve. Usually, what I find most fascinating about birds is the idea that they're really little feathery dinosaurs, and I'm not terribly interested in them for themselves, but I was pleased to spot a cormorant in the reserve - a tallish, black shape hunched on a rock at the edge of the waves. I also passed a Romany caravan with a couple of heavy horses just outside the reserve. Chances are, of course, that the occupants were not Romany in the slightest, but tourists. The last significant stretch of coastline before arriving in Crail was occupied by Sauchope Links Caravan Park. This is where the Crail Golfing Society originally had their golf course, but now it consists of half a mile to a mile of chalets, static and mobile caravans and a few tents. Walking though here was a bit of a strange experience. Quite a lot of the accomodation was empty, though immaculate, so it had a bit of a ghost town feel. It reminded me of nothing so much as Pollphail village at Portavadie. Portavadie is near where my parents live in Argyll, and I once camped there for a weekend when I was a member of the Venture Scouts. In the 1970s, Portavadie was to become a major money-spinner by being a centre for oil-rig construction, and a massive hole in the ground was dug to build the rigs in. An entire village was built to accommodate the workers. And no orders came. None. Nada. Zip. Or maybe even less than that. Pollphail is still empty, thirty years on. No-one has ever lived there. When I walked round it in the eighties, the fire alarms fixed to the walls were still in their polythene wrapping. A central canteen had smashed windows and it was obvious from the droppings on the carpet that the sheep appreciated the shelter if no-one else did. The big hole in the ground has been flooded and converted into a terminal for the new Portavadie-Tarbet ferry. Sauchope Links did have people in it, plainly enjoying themselves, so perhaps the comparison isn't fair - but it's what it made me think of. Finally, I arrived in Crail, and took advantage of the opportunity to mosey around a bit. Usually I have a reason to go to Crail, and I'm straight in and straight out, so it's the first time I've had the chance just to appreciate the place. I wandered down to the harbour, where there was an interesting harbour gate arrangement. Assuming I understood correctly, there were two slots in the wals at the mouth of the harbour, and a crane at one side, specifically intended for dropping individual bars of wood into the slots to build up an enclosure - no actual gate, and as far as I could see, no sluice arrangements. Quite unusual. I visited Crail Pottery. Somehow I've never really felt the urge to do so before, but that was a mistake and I will be visiting again. Some of their stuff is really nice - more suited to a farmhouse, perhaps, than my former council house, but I may not let that stop me. I came away with a very nice goblet which has just become my favourite receptacle for cold drinks. It has the capacity and the heavy lip of a mug, which is pleasant, but more heft, and a wider bowl. A tour of the village shops followed - most of the fare was as you would expect of a fair-sized village, but the butcher, J.B. Penman, was plainly outstanding. Although I had heard good things about him, a visit confirmed that this is a place worthy of an occasional detour. There can't be too many places where the butcher can tell you which medal your cut won at the Royal Highland Show! He may also be of interest to vegetarians for the extensive range of quality pickles and preserves he has in stock. I was also fortunate to pick up some small glass dishes from an art-supply shop to replace the old one I accidentally smashed earlier in the week. Last stop was a walk around the small village museum, to see such exciting artefacts as the town drum (used by the crier) and the provost's gown. Probably the most interesting single artefact was a replica of the town seal press, found in a wall space when an old house was being demolished. The original is in Edinburgh. The most interesting room was the one dedicated to Crail Airfield, now famously (or infamously) home of the Crail Thrash. Although I didn't really see the airfield on my walk, I passed beneath it - most of the pillboxes I passed would have been intended to protect it. The airfield dates back to the First World War, and the farmer who owns the land does whatever he can to get income from it as it is, because it's listed and he's not allowed to change it. Whether or not you think that is reasonable depends on how much you're affected by the traffic passing through to get to the thrash - my sympathies are with him, but I can understand why others might disagree! My sister was there a while ago with the reindeer for the BBC's Weird Science. A quick bus ride back to Kingsbarns and a goblet of chilled Banane Verte lemonade rounded off an enjoyable trip. The picture this time is another self-portrait, this time using Abi-Station Portrait Illustration-Maker. This one's a bit closer to reality than the Character Artist one (i.e. less flattering). There's another version of this one with a different background which will probably make an appearance at some point. It features me smiling. That was before I discovered the straight-faced option you can see in this one, which is much more me!